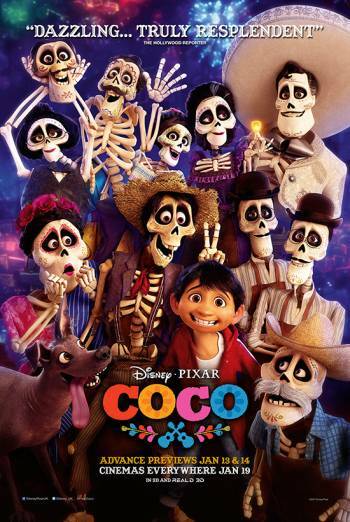 COCO is a US children's animation in which a boy searches for his musical hero in the Land of the Dead. Characters are chased, panic and occasionally despair. A character is frightened when he meets skeletons in a graveyard. These sequences are brief and reassurance is swift. A character is poisoned by a villain. Another is crushed by a heavy object, without detail. There are sequences of fantasy fights, but these are comic in nature. The death of loved ones is a theme of the film. Bad language is very mild ('jerk').